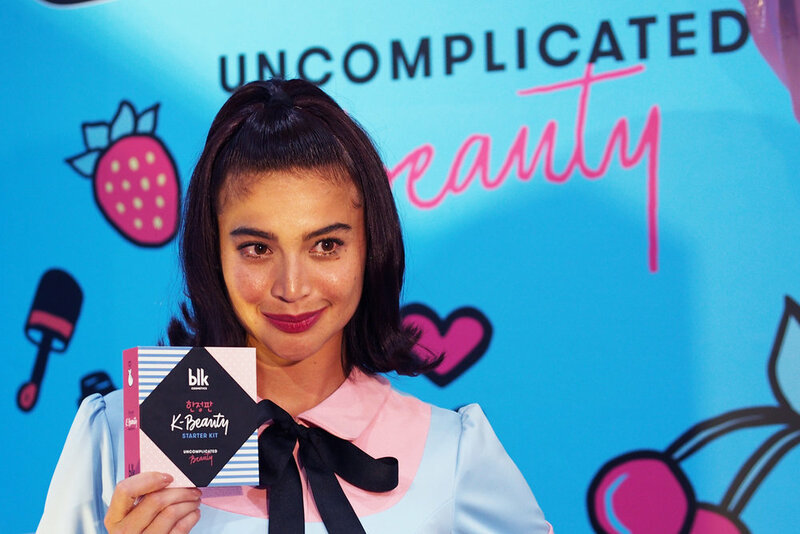 When blk Cosmetics launched in 2017, Anne Curtis wanted to keep makeup simple and uncomplicated. Their initial lineup proved promising and versatile as can be seen in Tellie’s tutorial for creating a K-beauty look for glasses with the blk Cosmetics Highlight, Blush, and Contour Palette. I nabbed the limited edition lipsticks released for Anne’s wedding, and like using the two shades for a gradient lip look. Creating K-beauty looks with blk cosmetics will be even easier now, thanks to the recent launch of their K-Beauty collection. If you haven't heard, Anne is actually a big fan of K-dramas, so it seems inevitable for her two loves to come together! Staying true to the brand's simple approach to makeup, blk cosmetics curated a K-Beauty Starter Kit (P997) consisting of the BB+CC Cream Stick, the Intense Color Liquid Eyeshadow, and the Lip & Cheek Water Tint plus a cute sticker pack. You can also purchase each item individually but those won’t come with the stickers. The BB+CC Cream Stick (P449) promises the benefits of both base types in stick form with a brush on the opposite end. The shade I have is Ivory Beige which is a little light for me, but there are two other shades in Light Beige (yellow tone) and Natural Beige (neutral tone). I have been using the BB+CC Cream stick since the launch and I’m quite impressed! It feels light and leaves a dewy finish, which is popular in K-beauty. I don’t always set it with powder, and it lasts up to 4 hours on my dry, dehydrated skin. Do note that proper skin prep is needed as it does cling to dry patches, and if you use a moisturizing primer and sunscreen, the finish can be a tad too dewy already. When set with powder, it lasted up to a whopping 9 hours on me with minimal blotting! The shade range is noticeably limited so I do hope they come out with more shades. Also, the brush is mostly useless. While I give it points for being detachable and easy to clean, I wish they included more of the product instead of allotting budget for the brush. It is small, short, and gave me a hard time when I tried to blend the BB+CC Cream in. I’d rather use my fingers on the go, or a buffing brush when at home. Unlike the usual eyeshadow pans and sticks, the Intense Color Liquid Eyeshadow (P299) uses a doe-foot applicator to deposit the product on the eyelids before blending with a finger or brush. The shade selection is very Korean-inspired, consisting of neutral colors in shimmery and matte finishes. The Gorgeous shade I tried appears to be the sole matte, with the shades I Love You, Hello, and Cute having shimmery finishes. You can use each shade on its own or combine them for more dimension. I have to say, I really love this product! It stays on for hours even without primer. I love that they included a matte shade that’s perfect for the single shadow look. It also doesn’t crease on my eyelids, and blending with a finger is a breeze. I rarely reach for a brush when using this. I hope they come out with more shades especially with a matte formula. Of course, it won’t be a K-beauty collection without a tint, so blk cosmetics came out with its own Lip & Cheek Water Tint (P249). Anne insisted on the shades Pink, Orange, Red, and Cherry to round up the selection. You can apply this on your lips full color or gradient, or on your cheeks for a natural blush. I have the Pink shade and I like it enough to carry it around. I find that it stains my lips well compared to other tints I’ve tried, which go on patchy. It is a bit pricier than other drugstore tints though so that may be a deterrent for most. It also disappears after a while, so reapplication is necessary. On the cheeks, this is easy to blend and gives a lovely flush of color. I prefer the next product though for cheek application, but the Lip & Cheek Water Tint is a good multi-purpose item to have in your stash. If the tint is not enough color for your cheeks, you can get the Creamy Cheek Paint (P349). The two shades, Peach and Strawberry, are great bases to create that refreshing Korean summer look. As this is a liquid blush, be careful in opening the product for the first time so you don't splatter drops of product. This happened to me while I was taking product photos and ended up with pink droplets on my white background. This also has a big applicator which I fondly call the "padfoot" because it's larger than the doe-foot ones we normally see. The reason is that Anne wanted the applicator to mimic a finger - something to help it apply easily and quickly. Be warned: the cheek paint is crazy pigmented! You only need one dot or a couple of really small dots to cover your entire cheek. This blends out to that popular diffused blush effect and lasts the entire day on me. I’ve actually been stalking for the restock of the Peach shade online and in the Watsons stores near us because I like it so much! I find that it layers nicely with my Nars blush-highlighter hybrids. I do hope they come out with more shades. Finally, we get to the lipsticks in the blk K-beauty collection. There are three shades in their signature All-Day Intense Matte Lipsticks (P299 each). The shades My Love (subdued peach), Beautiful (mauve pink), and Honey (berry red) are all Korean-inspired. I’m a huge fan of these lipsticks. The pigmentation is incredible, and I find that they give off this bold, yet softened lip look that I only get with my Korean brand lipsticks. And even though these are matte lipsticks, they are non-drying on my perpetually dry lips. I feel like the formula for these three is an improved version of the wedding lipsticks. Overall, I’m impressed with the blk Cosmetics K-beauty collection. They do need to include more foundation shades especially for the BB+CC Cream stick, but the products per se have good formulas. I love the price range, too, with everything under P500 though I feel like the tints could have been priced a little lower. I can't choose a favorite among the All-Day Intense Matte Lipsticks, the Intense Color Liquid Eyeshadow, and the Creamy Cheek Paint. The formulas are really good - so good that they're making me rethink the more expensive ones in my collection. I hope they make a liquid foundation next! Have you tried the blk Cosmetics K-beauty Collection yet? Which product did you like best? Check out blk cosmetics on their website, BeautyMNL, Lazada, Shopee, Zalora, and in select SM Beauty stores. The Powder Face-Off: Which local loose powder works best for combination skin?